At times you need to be able gather information into Sets where an entry can contain one or more entries or sets, or Nodes where an entry has child nodes each of whom can contain their own children. For me it’s usually a geographical tree (Continent, Country, County, Town) or permission roles (Administrator, Moderator, User). Although this is documented elsewhere on the net, here’s how I do this in PostgreSQL utilising pl/pgsql functions. The tree of nodes consists of one entry in the table per node, with the root node at the top of the tree. Selects on the table are fast, but updates are expensive. As the data contained in the tree rarely changes, this is perfectly fine for most purposes. 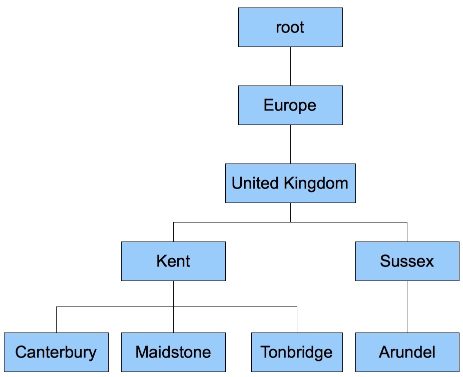 — The root node (0) preinitialised for the structure to work. Here we have the table initialised with the root node. At first it has the nodeid of 0, l=1, r=2 and d=0. Over time the l and r values will change as nodes are added to the tree. Now for the first set of pl/pgsql functions. This set of functions handle retrieval of nodes from the tree based on certain criteria. I’ll only show the function definitions for now as I’ll show how to use these later in this article. This is probably the most important function as it adds a new node as a child to another and as such is the primary means of adding nodes to the tree. Here you’ll notice that after the call to node_addchild() it returned the new node (nodeid 1) and updated the root node so it’s l and r fields bound those of it’s children.